What does Google Trends tell us? 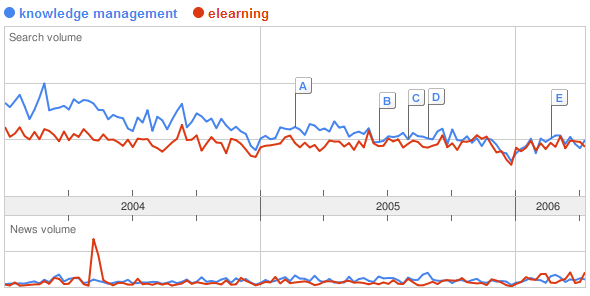 You can see that eLearning and Knowledge Management have both been trending downward in searches. Does that imply something as is suggested in: Organic KM: KM Is Losing Steam - Evidence From "The Database Of Intentions" ? Which to me seems like a fairly accurate depiction of the interest that I've heard at conferences over the last few years. With regard to software, less to do with interest than release cycles. Authorware, whilst always suffering from lack of marketing, is now hampered by delays due to transfer to Adobe.